Friday night, during her last show on Fox News, Megyn Kelly asked former House Intelligence Committee Chairman Pete Hoekstra whether he accepted the conclusion by 17 intelligence agencies in a recently released declassified report that Russia interfered in the 2016 presidential election and that this interference came at the direction of Russian President Vladimir Putin. “Video unavailable. 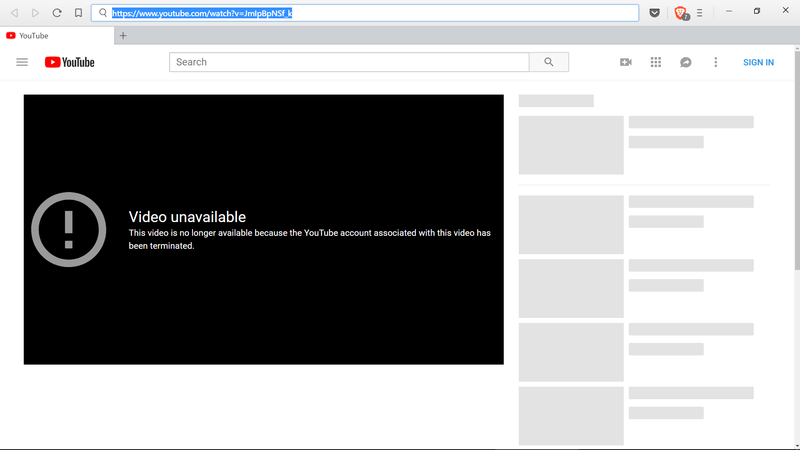 This video is no longer available because the YouTube account associated with this video has been terminated.” It doesn’t state the reason behind the termination of an account referenced by a regular contributor, respected author, and former CIA analyst at the Fox News website. The account probably couldn’t offend even a snowflake, and it contained at least one video of extreme importance to the public. Why was the account and/or the video banned? The only answer is that Google quietly removes from public view the most important evidence supporting conservative causes and President Trump. This isn’t necessarily written corporate policy. Possibly just a few low level employees that collaborate with the new Democratic Party, the Center for American Progress, or other foreign and DNC-affiliated entities are responsible. Another video (https://www.youtube.com/watch?v=Oi2PYn6G54Q) of the same interview, linked from Two More Reviews: ODNI / CIA Russia Report Was Politically “Rigged”… on The Conservative Tree House has also been removed by Google/YouTube. Many small conservative websites have links to deleted YouTube videos. Google’s actions hide evidence that supports conservative positions on specific topics, and undermine credibility in general. But they also cause enormous damage to the public debate by creating multiple perceptions of reality. Liberals visiting conservative websites see works that are completely different from what authors have created and published. Where conservative authors provide rock solid video evidence, liberal readers see black screens and conclude that conservatives have made false claims and provided dead links with the expectation that readers would not check them. The deleted video is part of Megyn Kelly’s last show on Fox News that aired on 2017-01-07. Pete Hoekstra appears 25 minutes into the show in a segment dedicated to the so-called Intelligence Community Assessment. Let me know, if Google deletes it, too. Google deletes inconvenient evidence from other web properties it owns. See Website that archived Blasey Ford’s high school yearbook disappears from Google-owned Blogspot, published by the American Thinker a few days ago. 2018-10-06 update: Google’s partner Twitter QFD-shadowbanned Adam Carter (@with_integrity), a prominent cyber-security researcher and skeptic of the “Russian hacking” conspiracy theory. 2018-10-10 update: Google messes with people and websites it doesn’t like in other ways, too. Russell Cook’s Gelbspan Files is an important climate realism resource. When a Google search cannot hide it, it is displayed with a false warning “This site may be hacked” and a link to Google Help, telling the user not to visit it. More examples were added after the first publication on 2018-10-05. The last update was on 2019-02-27. Thank you for your terrific research on Mueller et al. The more I read about Russiagate the more convinced I become that our government is almost completely corrupt and is aided and abetted by the MSM and Hollywood. The slavish obedience of Google, Twitter and Facebook is more difficult to understand, but I’m sure it’s a combination of fear and greed. I wonder who’s paying them off. Surprisingly, after years of trying to unbrainwash my son, who was indoctrinated into the climate religion in public school and regarded me as an embarrassing nut, the Kavanaugh smear has opened his eyes to Democrats and their lies more completely than any other issue. He is now so thoroughly dead set against Democrats that he can never return to his former trust in them. So, take some comfort that the Democrats are revealing their sinister motives and means in many ways. Thanks! You’ve made an excellent point by connecting the problems to Google, Facebook, and Twitter. They hold enormous power, and used to be trusted more than MSM.